For almost twenty years of Ukraine's independence, the term "antifascism" used to have very limited currency in the established political discourse in Ukraine. Until 2010, "antifascism" was primarily used as a form of self-identification by an element of Ukraine's left-wing movement, as well as being employed by the far right groupuscules to refer to their left-wing opponents. Hence, until 2010-2011, "antifascism" remained a notion that largely belonged to the subcultural sphere of the physical and symbolical strife between left-wing and far right activists. Yet when the notion of antifascism did enter the mainstream political discourse in Ukraine, it immediately became extremely problematic. The problematic nature of the notion had little to do with what "antifascism" essentially implied – that is opposition to fascism – but resulted from the manipulated use of the notion of antifascism in the post-Soviet space in general and Ukraine in particular. The manipulated use of "antifascism" has been increasingly prominent in Russia since Vladimir Putin's second presidential term (2004-2008). During the "Orange revolution" in Ukraine, when hundreds of thousands of Ukrainians protested against the fraudulent "victory" of pro-Russian politician Viktor Yanukovych in the 2004 presidential election, pro-Yanukovych media in Ukraine and pro-Kremlin media in Russia slammed the leaders of the largely pro-European "orange" protest movement as "orange fascists". To oppose the virtual threat of an "orange revolution" in Russia itself, the Presidential Administration launched the Youth Democratic Antifascist Movement "Ours" (Nashi). The imagery of the movement drew extensively on the legacy of the Soviet Union: the prevalence of the red colour, Soviet-style slogans, and even their official website was registered in .su domain (.su was originally assigned to the Soviet Union). These events reveal the basic argument behind the manipulated use of the notions of both fascism and antifascism in Russia. Since it is the Kremlin's geopolitical belief that particular sovereign post-Soviet states belong to the Russian sphere of influence, Moscow interprets post-Soviet sovereign countries' attempts to move away from this sphere as anti-Russian actions. As the Kremlin also adopts the political cult of the "Victory in the Great Patriotic War" seen as the struggle between the Soviets and fascists, as well as drawing on the Soviet legacy of defining fascism as anticommunism and equating it with Anti-Sovietism, Moscow tends to interpret the perceived anti-Russian sentiment as fascist too. Hence, the term "antifascism", in its manipulated interpretation, implies an opposition to the perceived geopolitical threats that Putin's regime allegedly faces. It was in a similarly distorted interpretation that the notion of antifascism entered the mainstream Ukrainian political discourse in 2010-2011. This development was associated with three major events. First, in the beginning of 2010 Viktor Yanukovych was elected president of Ukraine, adopted pro-Russian foreign policy and started suppressing political opponents. Second, the same year, Russian politician and businessman Boris Spiegel, who had close ties to the Kremlin, founded, in Kyiv, the World without Nazism organisation (WWN). Third, in 2011, Vadym Kolesnichenko, Yanukovych's major ally, launched the International Antifascist Front (IAF). While both organisations, i.e. the WWN and IAF, officially aimed at fighting against xenophobia, racism and glorification of Nazi crimes, their real objectives were different. The WWN promoted the Russian version of history of the twentieth century, advanced Russian foreign policy and tried to influence public opinion in former Soviet republics. 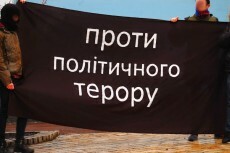 The IAF, in its turn, organised protests against the political opposition to Yanukovych. Originally, the IAF attacked the far right Svoboda party that was critical of Yanukovych, but since Svoboda strategically sided with the democratic opposition, the latter was attacked too. Therefore, the protests held by the "antifascist" organisation against the entire political opposition to Yanukovych aimed at discrediting it as "fascist". The IAFG adopted this tactic from the Russian Nashi movement that attacked, from the "antifascist" positions, all the opponents of Putin. The activities of the WWN and IAF resulted in a conceptual conflict between the original definition of antifascism as a struggle against racism and right-wing extremism practiced by Ukrainian left-wing activists and the implicitly manipulated interpretation that implied promotion of Russian interests in Ukraine. The Ukrainian anti-authoritarian left-wing movement, due to its political weakness, failed to defend their interpretation of the notion. Especially after pro-Russian media and commentators started describing the "People's Republics" in separatist-held areas of Eastern Ukraine as antifascist "states" fighting against the "Kyiv fascist junta", the term "antifascism" became completely discredited. Today, Ukrainian left-wing activists have almost abandoned the use of the term in the public discourse and tend to talk about the struggle against racism, intolerance and political terror.